Ami Magazine, a weekly publication distributed world-wide, sets a new standard in Jewish media. Ami Magazine offers readers investigative and intriguing features as well as intriguing, inviting, and professional columns. The AMI Magazine umbrella includes Ami’s flagship magazine, containing timely news and opinion; Ami Living, addressing issues that affect the everyday lives of our readers; and AIM, an educational and entertaining magazine for tweens. Inserted within Ami Living is an innovative food magazine pullout, Whisk. Ami’s staff is comprised of some of the most seasoned and talented professional writers and editors in the Jewish world today. 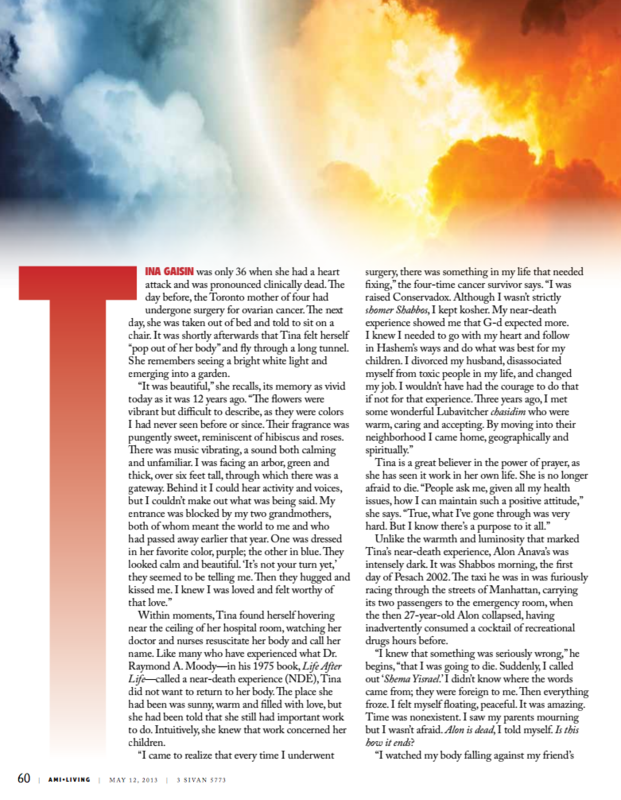 On May, 2013 Issue, Rabbi Anava was interviewed by Ami Magazine and a long article was written about Rabbi Anava’s NDE.